Tag: Chrome | Something Odd! I should probably close some browser tabs. I’ve tried various tab extensions, using Pocket, or even copying URLs into a text file but still I leave the same tabs open for days on end until Chrome crashes and I forget to recover them and, BOOM, they’re gone and I don’t care. Chrome 23 and Flash missing sound for you too? The latest version of Google’s Chrome browser in Windows reintroduced an old bug where Flash videos were missing all sound. It doesn’t happen to everyone but if you set your speaker configuration to Stereo you should hear sound again. Click on the Windows Start button > Control Panel > Sound > select the speaker/playback device and click the Configure button > in the Speaker Setup dialog that appears, if you have multiple audio channels listed, please test the Stereo configuration, and let us know what happens. I already had it set to stereo using the on-board Realtek sound chip in my PC but going through the motions of setting it to stereo and restarting the browser seems to have worked. There’s a lengthy thread here, there’s a bug open about the issue and it has been fixed. The next stable release will include the fix. Yay! 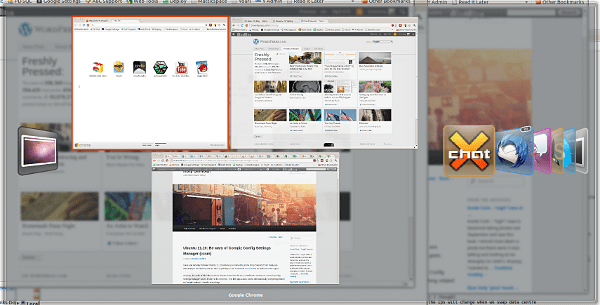 Ubuntu: ALT TAB between browser windows? I’m still using Ubuntu’s Unity desktop, which is saying a lot as I switched back to Gnome within a week or so of the previous release of Ubuntu. One of the remaining bugbears I had with Unity was the window or task switcher. It was impossible to switch between Chrome browser windows. I had to click on the Chrome icon in the Unity sidebar and select the window I wanted. It felt like Ubuntu had tried to emulate what Windows 7 did with their taskbar, but Windows did it better because the window previews are close to the taskbar. I’m not the only one to have this problem. You can either change window switcher in CCSM (oh oh, watch out when using CCSM!) or use ALT-`. That character is the tick character which normally sits above the TAB key on UK/English/US keyboards but may be elsewhere on other locales. I now need to get used to it like I did with Mac OS X.